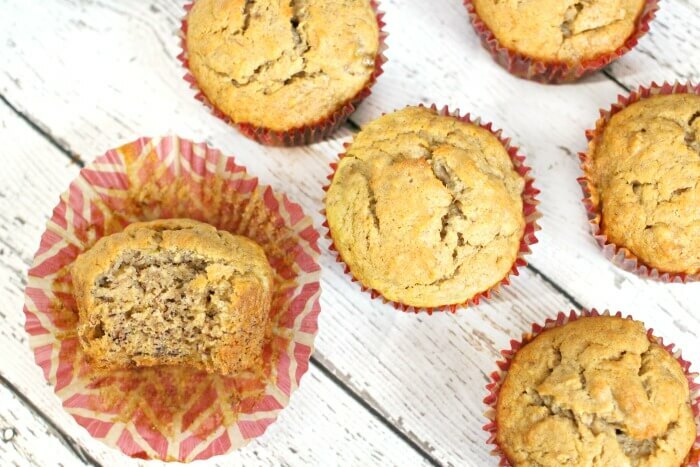 Banana muffins are notorious for being the recipe of last resort for those overripe bananas, but these are SO GOOD you’ll be rooting for those bananas to go brown quicker! 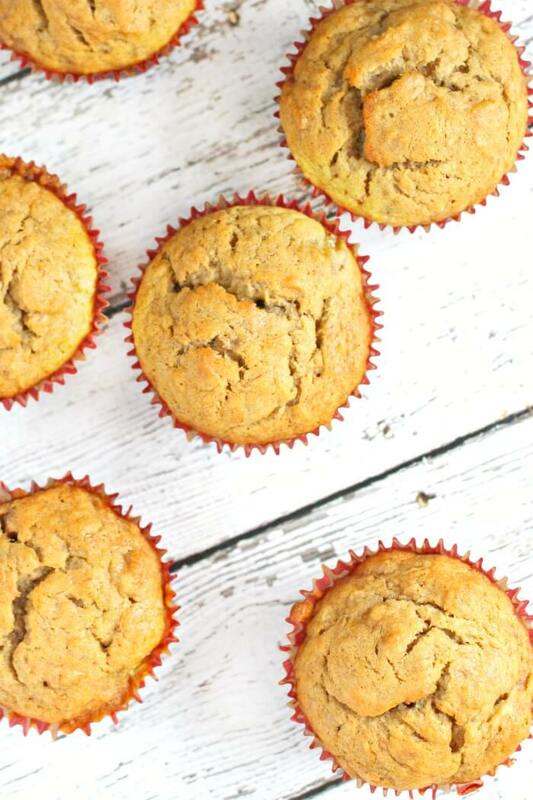 These taste like delicious banana bread muffins, but portable and easy for on the go! 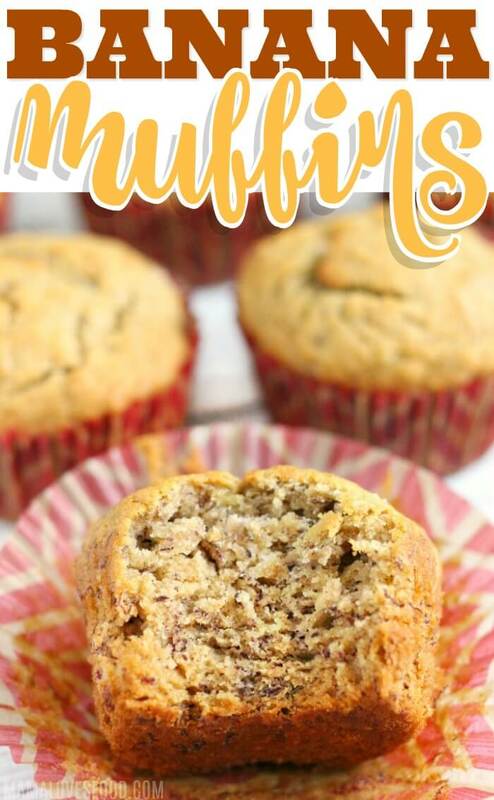 This banana muffin recipe can also be modified to make mini muffins or by throwing in some nuts or chocolate chips because, well, nutty banana chocolate chip muffins, y’all! If you want to branch out from the banana bread idea, check out my other banana recipes, and if you want to go full-on decadent, try slathering on a little whipped butter! Butter – set it out for a bit before making your recipe, as it should be at room temperature. Melted butter will work too. Brown Sugar – this recipe calls for gently packed brown sugar, not tightly packed. You can use light or dark brown sugar; the darker has more molasses, so has a richer flavor. Eggs – medium sized is fine. Over-Ripe Bananas – As your bananas go dark, you can toss them right into the freezer still in their peel. When you’re ready to use them, set them out for 5 minutes, use a knife to take off the peel, and let them thaw for a couple of hours. Or you can thaw them in the microwave in 1-2 minutes. Salt – table or kosher is fine. Salt in sweet recipes accentuates the flavor. Vanilla – extract not vanilla flavor. Although they both may be made from vanilla beans, the vanilla flavor is sometimes made from the extract plus imitation flavor. Baking Soda – baking soda causes the muffins to rise, and a muffin without a muffin top is a culinary tragedy. Cinnamon – Did you know that cinnamon may support a healthy blood sugar? And it’s yummy so win-win! Flour – You can use all purpose alone or a combo of all purpose and whole wheat all purpose flour. Optional: Chopped Walnuts or Mini Chocolate Chips – These will be stirred directly into the batter, but you can hold back a few to sprinkle on the top when they come out of the oven. First, cream together the butter and brown sugar. Next, add eggs, bananas, and dry ingredients (salt, vanilla, baking soda, and cinnamon). Blend well. Then, gently stir in flour, then walnuts. Finally, pour into muffin cups or well greased muffin pans (try our substitute for cooking spray – it’s magic!) and bake at 350F until a toothpick inserted into the center of a muffin comes out clean. You asked, we answered – here are your banana muffin FAQ’s. Always feel free to message us or comment with additional questions. 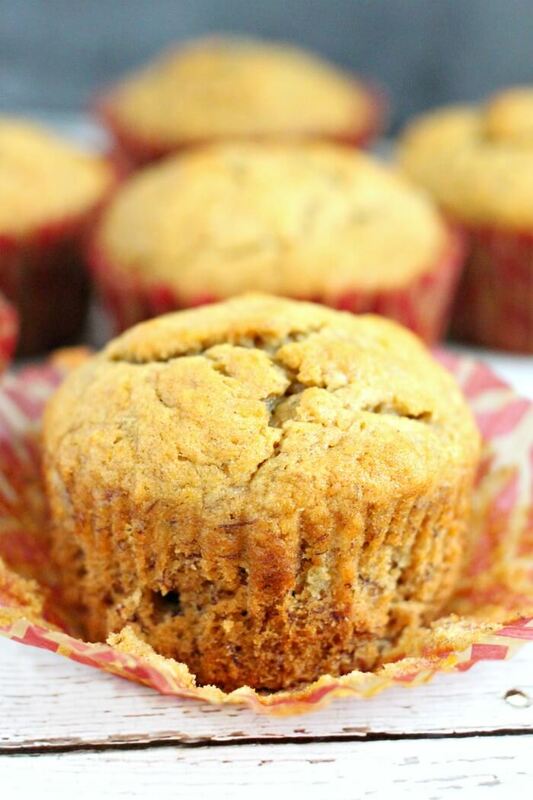 Banana muffins can be healthy if you limit the portion size. Using whole wheat flour in combination with regular all purpose flour will increase the fiber content. 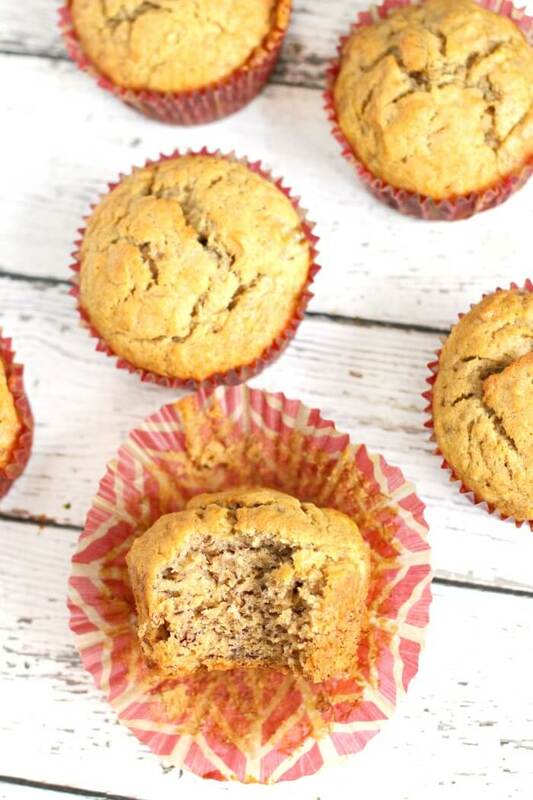 Traditional banana muffins are not gluten free as they use wheat based flour – we do have a Paleo Banana Muffins recipe made with hazelnut flour that is gluten free though! Banana muffins can be made healthier by limiting their size, substituting whole wheat flour for a portion of the all purpose flour, and adding walnuts for a healthy hit of omega-3 fatty acids. Bananas for Banana muffins should be very ripe. Soft to the touch with some black spots on the peel. The more ripe your bananas are, then the more sweetness and intense banana flavor you will have in your muffins. 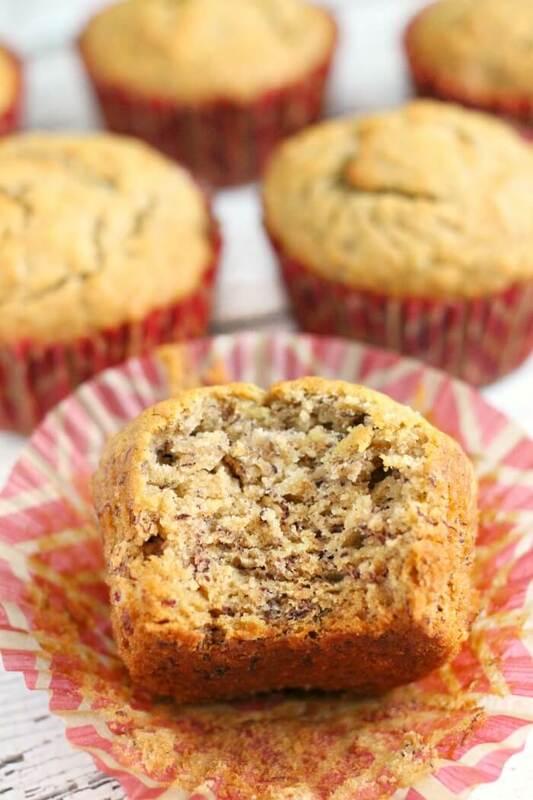 Using unripe or less ripe bananas will result in a drier, starchier, and less sweet muffin. I like to grab a pile of overripe bananas and mash them in a medium bowl, then freeze them, so we always have perfectly ripened bananas for this recipe. Make sure you label your mashed bananas so you know exactly how many are in there! This recipe is easy to make and very forgiving (once I forgot the eggs and they were still delicious! ), here are answers to some tips and tricks to help you in the kitchen. If you don’t see your question answered, feel free to pop it in the comments! All purpose flour is used for banana muffins, although you can replace a portion with whole wheat flour as well. You may need to add a little bit more liquid if you swap the all purposed flour for whole wheat as whole wheat flour tends to absorb more moisture. Sometimes if I use whole wheat flour I will add a handful of berries for additional moisture. Banana muffins aren’t typically served with icing, but if you want to top yours with icing, try a cream cheese icing for a classic combination. Peanut butter icing would also be delicious or even a chocolate ganache or butterscotch ganache. These are great on their own, but I love to liven up the recipe with easy mix-ins. A few of our favorites are mini chocolate chips, walnuts, blueberries, peanut butter, and cocoa powder. You’ll want to add about a 1/2 cup for ingredients like chocolate, walnuts, and blueberries, and 1 – 2 tablespoons for peanut butter or cocoa powder. I love making a double or triple batch of banana muffins so we have them for days or even weeks on end. Here is some guidance on how to store your leftovers. Store banana muffins (after cooling them completely) in a plastic bag or container. You can store on the counter top for up to 3 days, fridge for up to a week, or in the freezer for longer. Banana muffins last about three days at room temperature, stored in a plastic bag. This will vary based on the temperature and humidity level in your home. These muffins are very moist so they will grow mold faster than a typical bread recipe, especially in a humid climate. They will also last in the refrigerator for up to a week and in the freezer for up to three months. Make sure your freezer bag is sealed tightly, or wrap the muffins in foil before placing in the bag. 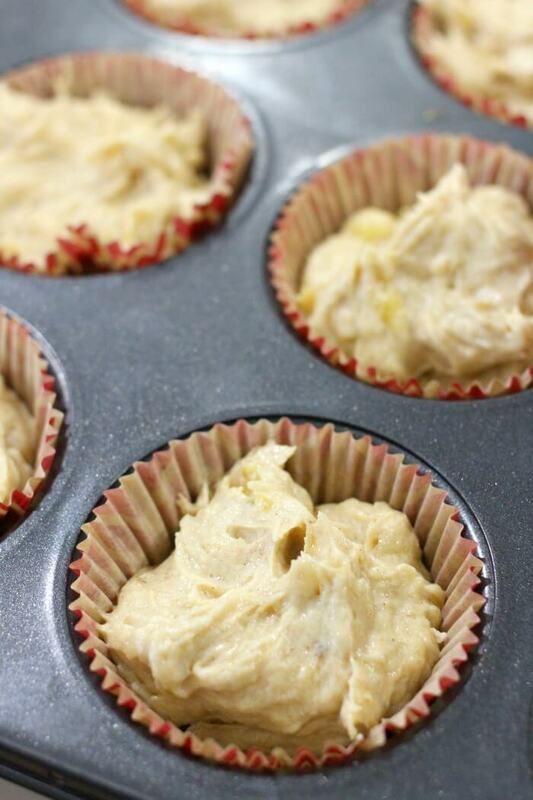 You can freeze banana muffins for up to three months when wrapped in foil and placed in a sealed plastic freezer bag. After that time, or if they are stored without foil, they will begin to degrade in texture and flavor. If yours have been in the freezer for longer than ideal, just warm them up and slather some butter on. They’ll still be yummy! Banana Recipes – You know those bananas in the freezer we talked about? Well, here’s more great places to use them. Banana Bread – This is a classic and one of our favorite simple recipes. Banana Pudding – Here you want to use fresh, yellow bananas! Chocolate Chip Banana Bread – Chocolate and banana are two flavors that go so well together, so why wouldn’t you add chocolate chips?? Banana Cookies – I know, right? Who knew you could make banana cookies!? This will become a family favorite. 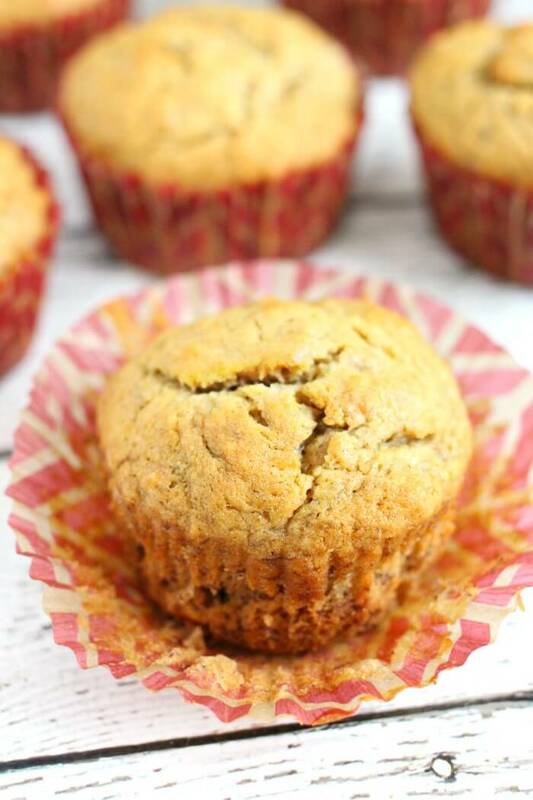 Banana muffins are notorious for being the recipe of last resort for those overripe bananas, but these are so good you'll be rooting for those bananas to go brown quicker! Pour into a lined or well greased muffin tin (we use this substitute for cooking spray) and bake at 350 degrees on the center rack for about 25 minutes. Check with a toothpick for doneness. My kids love banana muffins, especially with chocolate chips! Thanks for the recipe!